IRAN: Iran will introduce competitive tenders for large-scale wind projects in order to reduce costs, the government has announced. Few details are available, but according to local media, up to 1GW will be offered to private-sector investors, probably in several stages. The tenders will run alongside the current system of feed-in-tariffs, which will be reserved for projects under 100MW. However, work has not yet started on drawing up the tender documents, and "such tenders take a very long time in Iran", noted Hashem Oraee, president of the Iran Wind Energy Association (IRWEA). There interest was evident at the recent Iran Wind Energy Conference, which attracted more than 500 participants, 80 of them from other countries. In view of the lifting of economic sanctions, coupled with Iran's strong wind resource, the main theme of the conference was international participation in the development of Iran's wind industry, Oraee said. 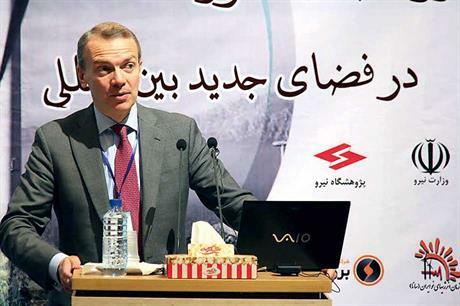 In a keynote speech, Giles Dickson, CEO of WindEurope (formerly the European Wind Energy Association), said major European companies were ready to seize the opportunity to invest in Iran and participate in knowledge and technology transfer. Indeed, Siemens already has a local team in place and "is very optimistic that this will mark the starting point of a successful development of our wind business in Iran," according to Thomas Richterich, CEO for onshore at Siemens' wind power and renewables division. It is a move that seems to have paid off, as the company has been named preferred supplier for a 62MW project at Siahpush, near Manjil, in northern Iran. Vestas, which helped develop and supply Iran's first installations at Manjil, is also "exploring opportunities ... and believes the market holds a very interesting potential," said Inigo Sabater Eizaguirre, the Danish manufacturer's head of global business development. "(We) are sharing our know-how with and delivering our technology to key players in Iran," he told Windpower Monthly. Delegates from Goldwind and Senvion also made presentations at the event, while Turkey sent a 15-strong team. Not that anyone imagines it will all be plain sailing. As Dickson mentioned in his speech, a number of barriers remain. These include concerns over the current power-purchase agreement arrangements, land ownership and access, long-term grid capacity and access to international arbitration for the settlement of disputes. While securing finance has become easier with the end of sanctions, foreign investors still face hurdles with banking transactions and will still need to work with a local partner. On the other hand, energy minister Hamid Chitchian has said the government will provide payment guarantees. Installed capacity in Iran currently stands at 141MW. The country is targeting 5% of electricity production from renewables by 2020, of which more than 2GW is likely to be wind, IRWEA estimates.